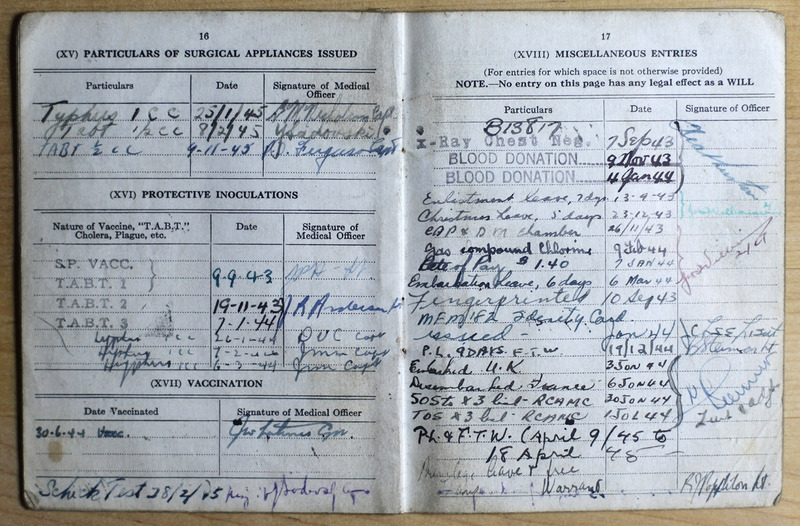 A WW2 soldier’s service book. A soldier’s Service Book can hold important clues as to how they spent their time in the military, the trouble is that the cursive writing, codes, abbreviations and acronyms can be puzzles in and of themselves. Here is one example of decoding a page in a WW2 soldier’s Service Book who took part in the invasion of Normandy. If you are attempting to decode a Service Book yourself, you can start with the Abbreviations page of our Research section, and post any questions in our Forums. These entries are mostly self-explanatory, the soldier being tested upon enlistment, donating blood and receiving some leave (free time). The number at the top of this page, B13817, remains a mystery to me. It’s not this soldiers Regimental Number, please leave a comment if you know or discover what this number may be. These two entries detail chemical weapon (gas) training. The use of the gas chamber to test if Service personnel could fit their respirators properly dates back to 1918. Servicemen fitted their respirators, entered the chamber and walked round for 5 minutes in an atmosphere of tear gas. After leaving the chamber, respirators were worn for a few more minutes to allow gas to dissipate from clothing. Special capsules of CAP, an early tear gas, were issued for this training. This routine was augmented in 1935. After going through the procedure to check respirators had been fitted properly, each man briefly re-entered the chamber without protection as a demonstration of the protection afforded by the respirator. By 1941 all Service personnel went through this respirator test and unprotected exposure every three months. Personnel were also required to experience a nose gas, DM, so that they might be able to recognise the gas and appreciate its delayed action effects. Personnel were exposed to DM for two minutes: no-one was required to experience DM more than once. These arrangements continued after World War II. Here the soldier receive a pay increased due to Royal Canadian Army Medical Corps training. Soldiers that received specialized training were entitled to pay increases. Leave granted to soldiers who were departing for postings overseas. The position of this entry in the Service Book leads me to believe that the date was recorded in error, potentially intended to be 19/2/44. Privilege Leave was granted to soldiers after they had served a certain amount of time. A Free Travel Warrant allowed a soldier to travel, usually by train, free of charge. Landed on Juno Beach in Normandy, France on D-Day. Struck Off Strength means that the soldier left, or otherwise ceased to be the responsibility, of the unit they were with — that unit has lost strength. The X3 here indicates that he was injured or was otherwise transferred on medical grounds. The Royal Canadian Army Medical Corps supported the 3rd Canadian Infantry Division during the invasion of Normandy so it makes sense that an injured soldier would be transferred to them. Took On Strength usually follows Struck Off Strength as the soldier joins a different unit, or otherwise becomes a different unit’s responsibility, it is seen as that unit taking on strength. As this soldier convalesced he was granted further leave. The story that this Service Book tells is that of a soldier who enlisted, trained, was sent to the U.K., landed in Normandy on D-Day, took part in the invasion of Normandy during the month of June 1944, was injured and subsequently evacuated. Private S.W. Olive of the 2nd Mobile Laundry and Bath Unit, Royal Canadian Army Ordnance Corps (R.C.A.O.C. ), looking into a crater caused by a V-1 flying bomb, which also wrecked the unit's vehicles. Fort de Merxim, Belgium, 15 October 1944. 1885 The Canadian Militia fights Riel's forces at Fish Creek during the North-West Rebellion.